It is very common to find minerals grouped together. 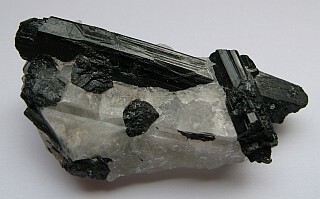 Because Quartz is the second most common mineral found in the Earth’s crust, it is common to find it grouped with other minerals.Here you can see Quartz with Tourmaline. On the Pyrite page you can see some Quartz grouped with Pyrite crystals and on the Fluorite page you can see Quartz with Fluorite.